If your requirements for pickup trucks need superior towing and hauling capabilities you probably won’t find them among light-duty full-size versions and you should step up in heavy-duty segment where a few contenders stand out. Among them Chevy’s Silverado 2500HD, GMC Sierra and new aluminum-bodied Ford F-250 are proven solutions but Ram also has its offer, the Ram 2500. 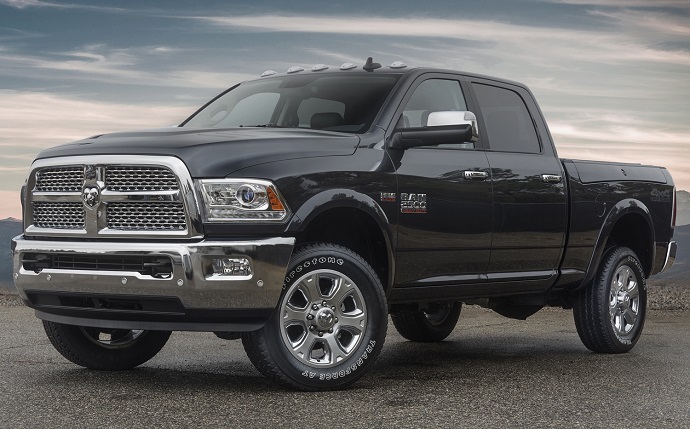 This model is positioned between light-duty version Ram 1500 and more capable Ram 3500. Like all modern pickup trucks, this version is also available in variety off trims and body styles. Compared with its main rivals, Ram 2500 offers one advantage and it is rear coil spring suspension which provides more compliant ride than models with rear leaf spring setup. Another small advantage of this truck is three engine options and it also offers one of the best interiors in the class. When it comes to upgrades for a new 2017 Ram 2500, company hasn’t announced redesign for this model despite all-new Ford F-250 was introduced. On the other hand, Ram has announced new off-road package. Ram claims that up to 35 percent of buyers exploit their trucks for off-road ride and therefore this package is intended to satisfy their needs. This package will be available on all trims with Crew and Mega Cab versions and with diesel and gas engines. When it comes to the power train, 2017 Ram 2500 4×4 Off-road package brings anti-spin differential at the back side. This system, when higher torque is used turns both rear wheels in tandem but system also unlocks the differential automatically which allows the wheels to rotate independently for normal ride and cornering. Off-road package also brings Blistein monotube shocks that are tuned for this truck and package and rear suspension includes five-link coil rear suspension setup. Another advantage of this package will be hill-descant control system sourced from the Power Wagon which allows driver to set the speed down the inclines by using buttons on the shifter column instead of using brake and gas pedals. Aside from the new off-road package, the brand hasn’t announced other changes and the model will likely continue with the same engines. Ford hasn’t also added new engines but it promised better power and torque figures which might be the case with Ram’s engines as well. So like in the current model the most variants will be powered with a 5.7 liter gasoline engine that should produce around 383 hp and 400 pound-feet of torque. The engine will be teamed with a six-speed auto transmission and version on CNG will also be available. Options will include two diesel engines a 6.4 Liter V-8 and 6.7 liter turbodiesel inline six. Former currently produces 410 hp and 429 lb-ft of torque while latter makes 370 hp and 800 lb-ft of torque when combined with six-speed automatic or 350 hp and 660 lb-ft with six-speed manual gearbox. Currently the most capable configuration is with turbocharged diesel engine and automatic gearbox which allows up to 17, 980 pounds while another diesel hits 16, 320 pounds and gas-powered 13, 890 pounds. The styling of the new 2017 Ram 2500 hasn’t been announced for redesign. However, some changes are possible but they are still unknown. What is sure, new off-road package will bring some distinctive details which will distinguish this version from others. It will sport larger fender flares which will be available in body or black color. These models will also include heavy-duty front hooks, underbody protection, all-terrain tires and 4×4 off-road decals at the back corners of cargo bed. This package as it was mentioned will be available on all trim levels on the Crew and Mega Cab models. The Ram 2500 already has one of best interiors in the class and for new model year it will retain that position. All versions will also offer plenty of room for adult passengers and expanded leg room will be available in Mega Cabs. Interior also offers plenty of pockets and storage compartments. What is also important, upgraded infotainment system will be available. The in-cab controls will also be large and logically arranged which will provide easy use. Model will also offer several optional cameras for cargo-view, rearview cameras, etc. As for available configurations, the new Ram 2500 will be offered as regular cab with two-doors and four-door crew and mega cab. The regular cab models will come only with 8 foot bed, while crew cabs also include 6 foot 4 inches bed option. The Mega Cabs ride on the same wheelbase length as the crew cabs but they combine bigger cabin with shorter cargo bed. The model will offer seven trim levels to be combined with cab configurations. There will be Tradesman, SLT, the Big Horn/Lone star, Outdoorsman, and also Laramie, Laramie Longhorn and Limited. The first two trims will be available on all cab versions while others are reserved for crew and mega cab versions. Among trims, models will ride on basic steel 17-ich wheels on the Tradesman trim while 18-inch steel and alloy wheels will be also available and 20-inch alloys will come on the Laramie Limited trim. Vinyl and cloth upholstery will be used in lower trims and leather trimmed interiors will be on Laramie and higher trims. LED lights, dual-zone climate control, an 8.4 inch based infotainment system with smartphone compatibility, power adjustable pedals and seats, heated and cooled seats and much more will also be available on higher trims. On the safety front, the Ram 2500 models include anti-lock disk brakes, traction and stability control, front and side curtain airbags, and rear view camera. It also is possible that Ram would advance with some advance driver’s aids for the new model year. So, the new 2017 Ram 2500 will offer improved off-road offerings and will stay among the best models in the heavy-duty class. Ram, however, might go with further upgrading but at this time it hasn’t announced anything except the off-road package. New models available with new off-road rig should start arriving at dealerships in the third quarter of this year. Closer to its arrival will also be known how much this models will cost and more precise specs.